The weather was thick and stormy... The king looked around and, seeing no blue sky, took the sunstone and held it up. He saw where the sun beamed from the stone. We know the Vikings were expert sailors and navigators. What we don�t know is exactly how they did it. It takes more than a keen understanding of wave patterns, bird behavior, and astronomy to traverse the waters the Vikings most commonly called home. With mist, fog, a sky of wool-thick clouds, and no compass, how does one reckon east much less latitude? One of the great mysteries of Viking seamanship was the use of the sunstone. Allusions to these enigmatic tools are found in the literature sprinkled throughout early recorded lore, as in the passage above. What exactly is a sunstone, and how does it work? People have been asking those questions for a very long time, and we've finally got a few answers (we think). And those answer come from a decidedly non-Viking place. In 1977 a shipwreck was found off the coast of Alderney, the northernmost of the Channel Islands group. Drowned by storms and treacherous waters in 1592, this ship carried dispatches bound for Queen Elizabeth's Chief Minister, Lord Burghley. It also carried, what some are calling, a sunstone. Amid pewter pots, cannonballs and cast-iron muzzle loaders divers found a piece of Iceland spar � a type of calcite crystal. Its existence among all the Elizabethan gear was something of a mystery, until it was proposed that it may have been used as a sunstone. Why would sailors of the 16th century need a sunstone when magnetic compasses were introduced to the North Atlantic in the 13th century? Experiments have shown that the presence of a single cannon on board was enough to throw off an early ship's compass. 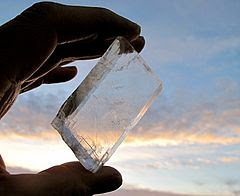 Researchers found that if you cut a hole in a piece of cloth or similar material, then hold an Iceland spar in the light passing through the hole, the crystal splits the light into two separate beams. When the crystal is rotated, the two beams vary in intensity depending on the angle of the sun and the individual crystal's properties. A Viking could "calibrate" his crystal when skies were sunny and sun direction and angle were known. Over time and in different conditions, he (or she) would learn the exact patterns the two beams of light made when the sunlight hit the crystal at varying angles and directions. After multiple trials, the scientists say they were able to locate the sun to within 5 degrees of accuracy every time they used their "sunstone," even on days with thick cloud cover or fog. If you want, you can visit the Alderney Elizabethan Wreck website.